Maya Nehal is currently an entrepreneur and the owner of DFW Print Solutions in Lake Worth. Prior to her print business, Maya worked for the City of Arlington’s Information Resource Center for 20 years and retired from the City of Arlington in 2006. 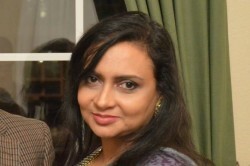 She has lived in Arlington for more than 30 years and is intimately involved in the North Texas Bangladeshi community. 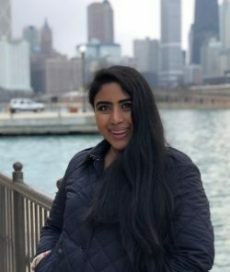 Maya is incredibly passionate about programs that help young Bangladeshis stay connected to their culture and heritage. 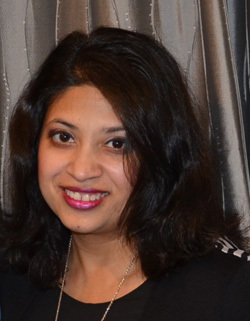 Maya has been an active leader in the Bangladeshi community for several years. 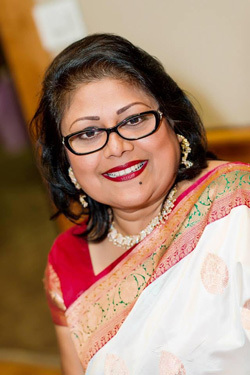 She is one of the founding members of the Bangladeshi Expatriate Society of Texas (BEST) and served as the organization’s President for four years. Iffat Hasan works as a marketing professional in the oil and gas industry. She has more than 15 years of experience in Corporate Communications and has worked in various industries such as defense, oil and gas, healthcare, local government, and non-profits. Over the past several years, Iffat has also volunteered to support cultural programs with the Bangladeshi Expatriate Society of Texas (BEST). She is slightly obsessed with South Asian music and dance, especially from Bollywood. If a Hindi song is playing, she is definitely dancing. With Milaana Dance, Iffat hopes to create an environment for people of all ages to come together and enjoy South Asian dance and culture. Sneha Sachin is a classically trained Bharatanatyam dancer and started learning at the age of 5 under Padmashri Chitra Visweswaran. During her dance career, she received a scholarship from the Central Government of India and has toured extensively around India for solo and group performances. While classically trained, Sneha is also very passionate about Bollywood music and dance. She feels Bollywood dance is a great way to relive stress and express creativity. Sneha also holds a degree in Civil Engineering and worked as a Geotechnical Consultant in Chennai, India before moving to the US. Soma has a diploma in fine arts from Chandigarh University and is also a certified graphics professional from Arena Multimedia (Aptech). She has 7 years of experience teaching in an international preschool, and has been responsible for curriculum development for various arts and dance activities pre-school and elementary school age children. She enjoys Bollywood music and dance, but also has a love for songs and music of Rabindranath Tagore. Based on her past experience, Soma has the perfect approach and mindset to work with younger dancers. In fact, she loves working with kids because of their honesty and open-hearted nature. Soma finds these qualities are essential as they allow kids to dance without hesitation and fully express their emotion while learning and performing. Shamsia Yusuf is a certified dance instructor from BulBul Academy of Fine Arts (BAFA) in Dhaka. As a student of BAFA, she was a 3-time winner of the Bangladesh National Child Dance Competition, winner of the Nutunkuri Award, and also received the Manikmia Scholarship. She trained under Sukla Sharker, Kartik Shina, Rahija Kanam, and Shibli Sadi. After graduating at the top of her class, she also served as a teacher at BAFA. Praseeda Danda is an instructor for Milaana Moves, the 50-minute workout class. Praseeda is currently a senior at Coppell High School who will be graduating in 2019. She is a former college ambassador and is a member of school debate team, the National Honor Society, and DECA where she qualified for the international career development conference. Praseeda has been dancing since she was 3 years old and competed and performed at various places such as the Farhan Akhtar concert, Vishal and Shekhar concert, Competitions on Zee TV, National Conventions, and more. Praseeda loves dancing more than anything and also enjoys choreographing routines in her free time. Her passion for dance is a flame that never burns out and only increases as time goes on.